This is a walk in Roslin Glen and along the banks of the River North Esk. The terrain is varied, using woodland/grassy paths and minor roads (some steps involved). 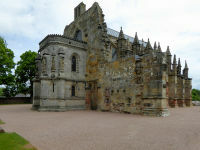 There will also be time for a visit to Rosslyn Chapel (built in the 15th century and well known for the part it played in Dan Brown's book - The Da Vinci Code). Entrance to the chapel is £9, (concession: £7). As some sections of the pathway are uneven, with boulders protruding and muddy as it runs along the riverbank, appropriate waterproof walking books required.